Gil was born at Moonee Ponds, in Victoria, on April 11, 1927 the day before his mother, Ellen known as Nell, turned 20. His father, Eric, was a theatre manager. Nell was originally a New Zealander. Eric’s father was Swedish, an illegal immigrant who jumped ship at Port Pirie in South Australia and married into a local family of German heritage. Three years later Gil’s younger sister, Greta, was born. Eric and Nell’s marriage was not a happy one. Eric’s job meant frequent moves. Gil attended nine primary schools in three states, but by the time he was high school age they were settled in Adelaide and Gil attended Norwood High, where he made some lifelong friends. These were the depression years, but people still went to the movies and Eric understood the value of public relations. Gil developed a life-long love of movies, but he did not care for his parents’ glamorous lifestyle. He admired the fathers of his friends, men who could cobble together just about anything in their sheds and he enjoyed the warmth and even the advice his friends’ mothers offered. In 1943 his parents divorced. Eric remarried twice. Gil’s half-sister, Robin, was born in 1954. At Norwood High, he began his career in journalism, editing the school magazine. Right to the end of his life, Gil read the paper every day and he always considered himself a journalist. He worked part time as a radio copy writer at Radio 5KA, but Australia was at war and as soon as he was old enough, in 1944 at just 17, he enlisted in the Royal Australian Navy as a seaman. This set in train the second theme of his life, which continued through his young family’s love of sailing, his public relations work with shipping companies and in retirement, in his interest in naval history. Gil didn’t talk about his naval career for many years, but about ten years ago he told me this story. Gil and his friend, John Stapleton, also known as Kanga, were given the job of guarding seven Japanese prisoners. They had been told the Japanese were monkeys. Using sign language, they worked out some of the prisoners were their age. Gil said, ‘Kanga, they are just like us’. Kanga replied, ‘Yairs, they are not monkeys at all’. Gil wrote: “So did reality dawn on two Australian youths, fed for years on wartime propaganda. I wondered how we would ever deal with what we were learning on this voyage”. There were more profound revelations during his naval service. Two years ago, Gil gave the address at the Combined Hunters Hill Anzac Eve Memorial Service. He very movingly described some of his experiences as an ordinary seaman on the Corvette HMAS Rockhampton. After his discharge from the navy in 1946, Gil returned to his radio job. He was persuaded to take up a Commonwealth Reconstruction Training Scheme offer to go to University, the first member of his family to do so, and undertook an arts degree. He attended Adelaide University and edited the student newspaper On Dit, which won an international student newspaper award. Gil decided he was ready to settle down, so he looked around the University refectory and chose three likely candidates. One was Vincie Porter. They married on May 13, 1950, and with Vincie he found the security and support, the loving, stable family life he had always craved. After graduating, Gil joined the Adelaide News owned by Sir Keith Murdoch, which passed to his son Rupert with whom Gil became friends. Gil said Rupert had a reputation for criticising the establishment. They both belonged to the Fabian Socialist Society. Don Dunstan was the secretary and Rupert gave the inaugural address. Myself, Janet and Roland were born in Adelaide. In 1956 Gil took up a job with the Sydney Morning Herald, and we moved to Sydney, where the family was completed with the birth of Nancy. Vincie was an advocate of natural birth, and Gil had argued publicly for the right for fathers to be present at the birth of their children, an extraordinary notion in the 1950s. Nancy arrived before the doctor, but both Gil and Vincie were well experienced by that stage and Nancy was delivered safely. Gil had always loved music, with a particular interest in jazz. As a sideline he reviewed records, and he wrote a record column for the Sun Herald until 1974. This was a great boon for us children: we used to get the latest Beatles and Rolling Stones records before they were publicly released, as well as tickets to concerts. He even got Janet the autographs of all the Rolling Stones. In 1958 Gil moved to TV Times, and we got one of the first television sets in our street. In 1959 the family moved to Drummoyne, just across the Parramatta River from Hunters Hill. The family took up sailing. Gil loved mucking about in his old inboard motor board. He built a number of boats, including a heron for himself. Gil by this stage had become one of those fathers he so admired, with a workshop crammed full of things of varying degrees of usefulness, where he was able to turn his hand to many things. When I say crammed full, I mean it. It was a family joke that whenever Gil went to the tip, he came back with more stuff than he took. After 10 years at TV Times he joined the Public Relations company Nielsen McCarthy, where he looked after the overseas shipping conference association and also advised some Swedish shipping lines. He travelled to Europe for the first time, and went to Sweden where he renewed contact between our Australian and Swedish families. This was an important event in our family history and it lead to many happy and rewarding visits and a deeper understanding of who we are. The PR world was stimulating, but very high pressured and Gil wanted a change. Vincie, a country girl, was happy to move back to the land. In 1970 they bought land at Mudgee with the idea of planting grapes and retiring. It takes several years for grapevines to become productive, so Gil signed on as editor of The Mudgee Guardian, which was then a privately owned paper, printed three times a week on an old hot metal flat bed press. Gil said it was the best job he ever had in his life because he could interact with the people he was writing about. When he selected the land, he was advised by an old navy friend, Ray Ward. The farm, which they named Botobolar after the region, had an old shearing shed on it. Ray predicted that shed would become a winery. And that’s what happened. In 1974, when the first crop was ready for picking, Gil was offered such a poor price he decided to make his own wine. Gil quickly rejected the practice of clean cultivation, where all the weeds were cleared and the vines stood in bare soil. The thinking was that with only vines to predate, that’s where all the pests would go, whereas if there is a choice of weeds about, chances are the vines will be left to flourish. Then the vines were attacked by cut worms. The Department of Agriculture advice was to spray DDT. This was not what Gil had left the city for, and he decided not to spray. The department of Ag was not impressed: a senior officer visited the property and saw it was covered in weeds and proclaimed it was ‘a bloody disaster’. It took a few years, but Gil developed a system of farming without pesticides and herbicides. Locally, Gil said they were regarded as ratbags, and the word ‘organic’ didn’t even appear on the wine label. Gil said he sold the wine on its own merits. Then the organic growers got together and formed a certification system. The English company Vintage Roots persuaded him to send over some wine. It was such a success Gil and Vincie were invited over to the UK in 1988. When they came back organic growing went on the label. 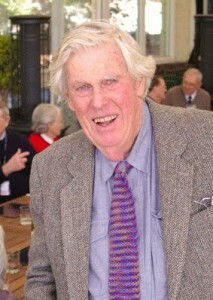 While he was in Mudgee, Gil was a foundation member of the Mudgee Wine Grapegrowers Association. They formed a society for the appellation of Mudgee wine, in an early attempt to verify the quality and origin of Australian wines. It was criticised by big companies but it is now law. He helped local cattle producers form a beef society, and realising the wineries needed tourism dollars, he actively promoted local wine tourism. He helped set up Mudgee Wine Week. As president of the local TAFE, he enabled vineyard and winery workers to build up their skills. He was also instrumental in setting up the Mudgee Small Farm Field Days, which continue to be an outstanding success. When Gil was awarded the 2008 Graham Gregory award for contribution to viticulture and wine making they described him as the godfather of the Australian organic wine industry. I remember working one Saturday on our small scale bottling line in the winery, in those days we hand dipped the bottle neck in beeswax, when a visitor asked if we only worked weekends. Vincie set him straight: it was a 7 day a week, 363 days a year job. (The winery only closed on Christmas Day and Good Friday). In 1994 Gil tired of the long days and constant demands of farming, and they sold the winery and bought a house in Hunters Hill, where they both quickly joined in the life of the community. Gil said he regarded Hunters Hill as a big country town. He received a centenary medal in 2000, and was Hunters Hill citizen of the year in 2002. Throughout the Mudgee and Hunters Hill years he continued to write. This included the well-loved Botobolar Bugle which was filled with Gil’s observations and ever-increasing knowledge about grapegrowing, wine and organic farming. He wrote for the 2MBS FM magazine for four years. In later life he became an author. When the Mudgee grapegrowers thought there should be a history of wine in Mudgee Gil offered his services. The result was the book ‘Some of my best friends are winemakers’. He collaborated with his relative Ray Specht, and cousin Mark Wahlqvist on a history of the German side of the family in Australia, ‘The flight of the woodpecker’. Then he became interested in naval history, and wrote a book about the corvette he had served on during the war, HMAS Rockhampton. He said he wrote it mainly for his shipmates but it became popular with people who wanted to know more about the war, and he recently reprinted copies of the book. Of course none of this could have been accomplished without Vincie by his side. At the end, all he wanted was to be at home with Vincie, and as always, she was there for him. This entry was posted on Friday, December 14th, 2012 at 1:56 pm and is filed under speeches. You can follow any responses to this entry through the RSS 2.0 feed. Both comments and pings are currently closed.